Oh, the Horror is Sulla Terra! Alien 2: On Earth or Alien 2: Sulla Terra as it's called in Italy is one of Italy's infamous rip off sequels to a Hollywood production, in this case, Ridley Scott's Alien. The film takes place in a cave after a shuttle from space returns to Earth. The film is entertaining in some aspects, it definitely doesn't work as a sequel to Alien to me. I give the film a 3.5/5. I was joyed to see Michele Soavi in the film as Burt. Soavi played Jerry the man with the mask on his face in Lamberto Bava's Demons and directed the film Dellamorte Dellamore. The video is amazing for a film that's over thirty years old. The first shots of the film appear really blurry because it's stock footage, but after it cuts to to the real footage shot by "Sam Cromwell", it looks amazing. I have nothing but praises for the video transfer. The only thing that keeps this from being a complete 5/5 is the opening and the ending. As stated, the opening is bit blurry due to stock footage and the ending looks rough, but it's amazing. 4.5/5. There's only one audio track, English DTS-HD MA 2.0. It sounds fantastic. I wish there could have been more audio tracks, but this takes the cake. 4.5/5. The extras consists of a Dutch VHS trailer and B-Roll. The VHS trailer is ok quality and the B-Roll is taken from the actual film source. My biggest complaint with the B-Roll is that there's no sound at all. They could have thrown the cool theme song on the video to make it more entertaining. Extras get a 3.5/5. Overall, this is a solid 4/5 Blu-ray. It's amazing that a studio like Midnight Legacy can bring their "A" game to film that's over thirty and compare it to another studio like Timeless Media Group who does a piss poor job on their Howling Trilogy release. 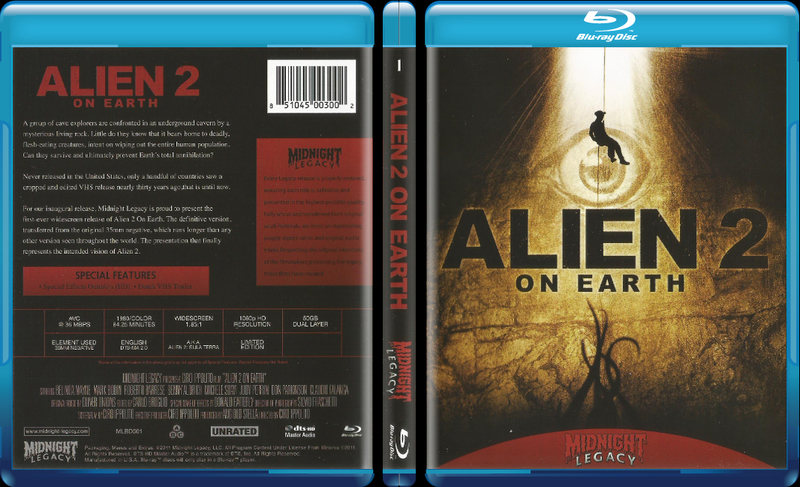 Alien 2: On Earth is an amazing release and one I'd never imagine I'd see on the Blu-ray format. I look forward to all the future releases by Midnight Legacy.